Not long after we got our early digital version of Slugs & Bugs' "Sing the Bible," we were listening loudly on the way to school right after Thanksgiving break. I dropped off the kids and pulled away alone in my van. And, yes, I was tempted to keep listening to this kids' music. Each one of us has our favorites. I really love "Two Shirts," "Be Dressed" and "Romans 8." I could also listen all day to "Rejoice," which is Sally Lloyd-Jones reading my favorite verses from Philippians 4. She and the African Children's Choir are wonderful additions to this CD. Cate claims it all as her favorite, but she did get excited when her memory verse at school recently (Proverbs 3:5-6) was on the CD. In typical boy fashion, Ben likes the monster song ("Deuteronomy 6:5") and "Alien." My husband Greg is also a fan of "Alien," but he seems to have a good time with them all. Yes, memorizing scripture, talking about aliens, and hearing monsters and bees sing truth all happens, thanks to Randall Goodgame's creative ideas and friends. I've been excited about this album since Randall Goodgame started talking about it online and when I saw him in November 2012. I didn't hesitate to throw some support into the KickStarter campaign. I say this every time Slugs & Bugs has a new CD, but this is my favorite. And I really mean that. How could anything top having your kids memorize scripture, laughing, hearing sweet African voices, and listening to quality music all at the same time? And because it's so good, I'm giving alway a copy! I got five copies with my KickStarter donation, but I had to order more because the four extra copies were gifted. So I ordered more and one of them is for one of you. Enter with the Rafflecopter below. This giveaway is open to U.S. and Canadian residents. A winner will be randomly selected on Thursday, Jan. 16. And if you don't win, go buy it. UPDATED to congratulate Teresa Howes! This CD is coming your way. Hope you and your boys enjoy it! Disclosure: The opinions expressed here are mine and nobody paid me to tell you about this. And I'm gifting a CD I paid for myself because it's really that well done. We would love to win this CD. We just finally bought his Under Where? CD for Christmas. We all love slugs and bugs and can't wait to hear the scripture songs! 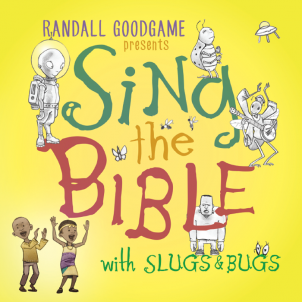 Never heard of slugs and bugs before but with four littles, I'm always looking for ways to get scripture into my kids! This cd sounds like a great one! You can listen some of the other Slugs & Bugs stuff on YouTube. Some of our favorite songs are I'm Adopted, God Made Me, Stop, Under Where? ... and really the list could go on. The songs on YouTube have fun videos that go with them. You're going to love it, Tabitha! I'm sure my kiddos would like this! I sure they would too, Teresa! Thanks for entering!